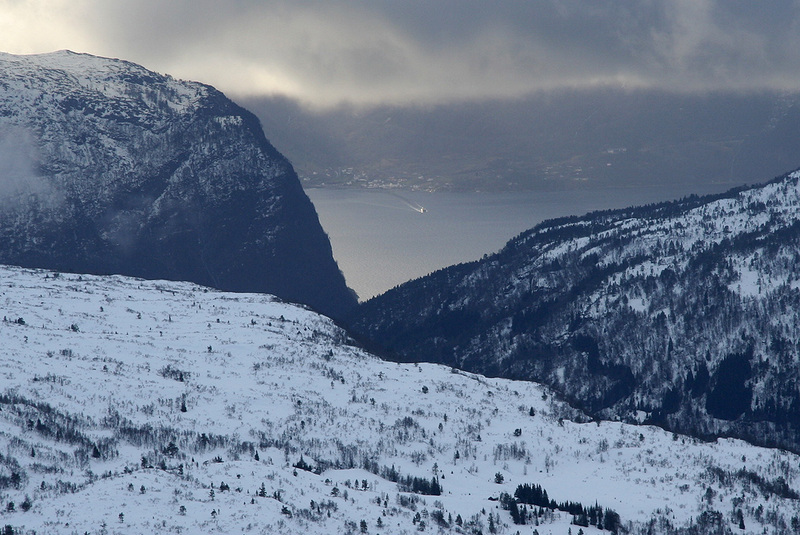 How to get there: From Bergen, drive E-16 to Voss. Continue straight and merge onto Hwy. 13 in the direction of Granvin. 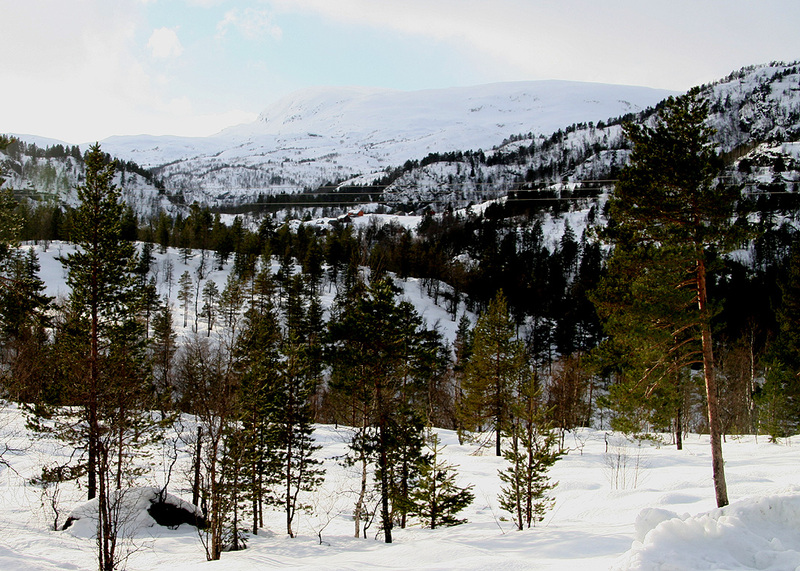 Drive approximately 14 kilometer from Voss and locate a small road with a sign for Bulko, that goes right just as the main road descends to the small lake Moavatnet (227m). Drive this small dirt road as it climbs steeply, for about 2.7 kilometer. There is a large parking area on top of a hill. You may pay (NOK 20 in 2007) some toll in a metal box. This is the trailhead, location N60:34.064, E006:36.494, elevation 518 meter. Route description: In summer, there is a nice trail, see the description of Arnt Flatmo. 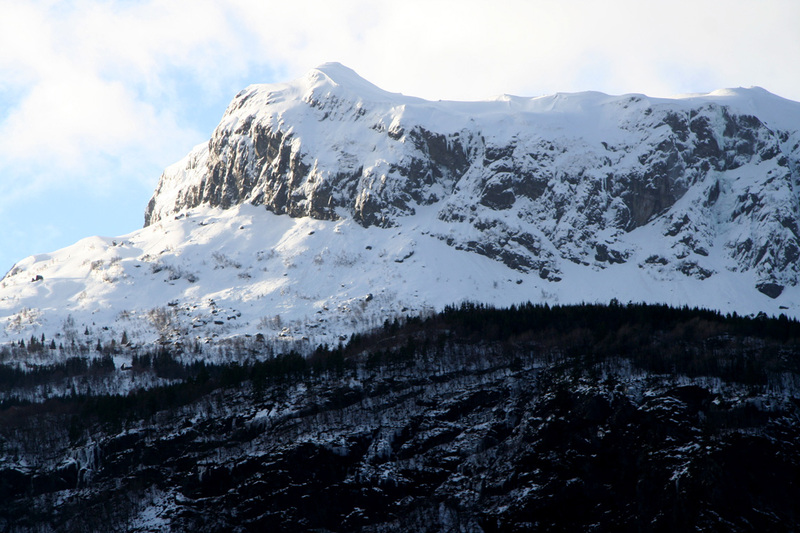 In winter, the challenge is to find a way up the steeper cliffs that seem to protect the mountain at the lower elevations. We tried two different routes and they were both steeper than what normal people would call a ski route. It is likely that the best ski route runs between our two routes, that is, along the trail marked on the map from Bulkuhagen to Horgastølen. Comments: I did this climb with my son Pål Jørgen, age 17. We started at 1015 and skied along a well used track that more or less followed the power line. The terrain above us was full of cliffs and steep sections, our trail turned out to serve local huts and we concluded that we needed to head uphill rather soon. We found a fairly promising line and skied as high as possible. The next section was a short scramble on foot before we located another ledge that headed uphill. Sidestepping on this ledge, we reached more level terrain just below Horgastølen. From here, we could follow the terrain uphill in gentle bends without any major difficulties. This turned out to be a pretty direct line, as we climbed the final slope to the more level summit plateau with a large cairn. We rested and had lunch, arriving two hours after we started out. The clouds were drifing around, but the visibility was not too bad, so a few pictures could be taken. We left the summit around 1230 and skied a different route down passing the Lyklaset summer farm, before running into more semi-steep terrain, ending in a short scramble (on foot) to hit the road at the Bulkuhagen farm, about 400 meter on the downhill side of our parking. We were back at the car at 1345, the trip had been quite nice and the skiing on the mountain was very good. We did not notice any ski tracks, appearently this mountain is not skied very often. 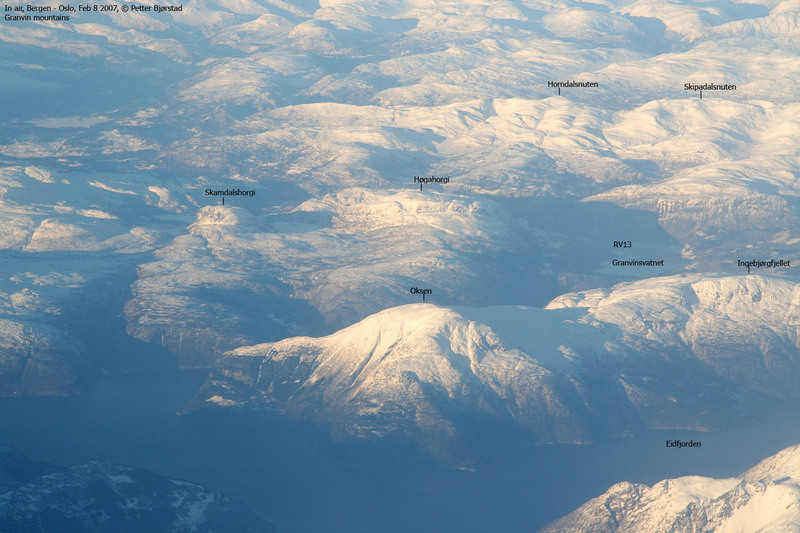 Høgahorgi, as seen from the air on February 8th. 2007. Høgahorgi, as seen from Oksen on June 15, 2008. 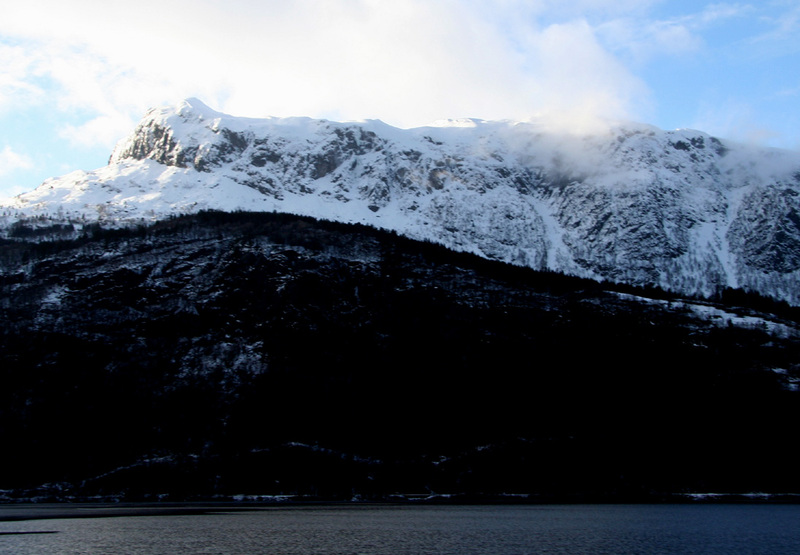 Høgahorgi, as seen across Granvinsvatnet (24m). The summit is in the middle of the picture (a bit back). Horganipen, (1035 m), the south summit. 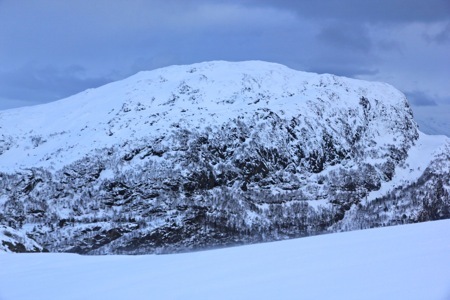 The main summit is on the right hand side. Trailhead view, southwest, not towards Høgahorgi. 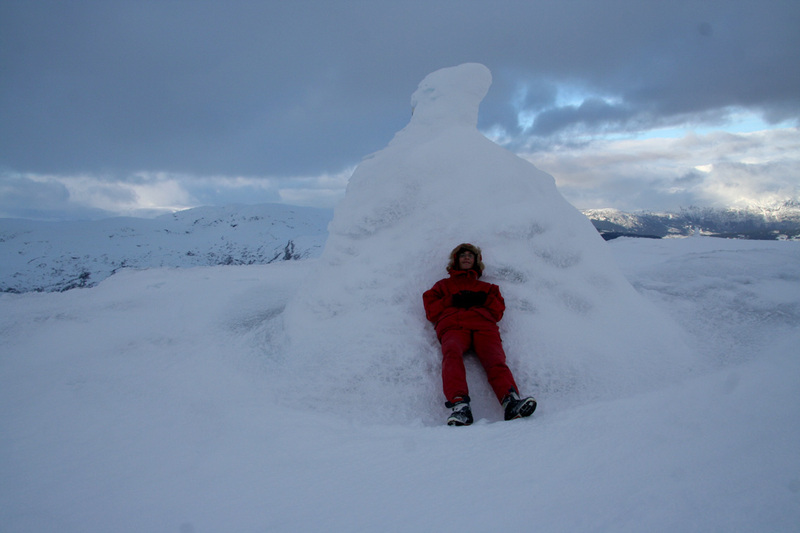 The summit cairn, Pål Jørgen taskes a short rest. 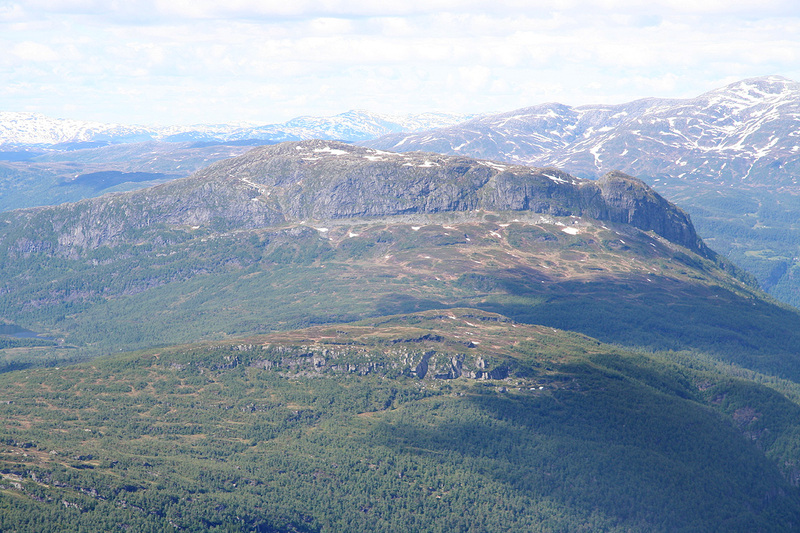 View east, Kjerringafjellet (1051m) and Kvasshovden (1065m). Panorama view II, from north to east.